The inaugural Brew U at the Culinary Institute of America in 2016. The Culinary Institute of America’s ”Brew U” returns for its second year on Saturday, October 7. An exciting beer festival that combines sampling from top breweries, food and education, this year's Brew U will feature 15 New York State Craft Breweries, including the Brewery at the CIA. A tour of the CIA Brewery will be offered as well as the opportunity to learn about the college’s Art & Science of Brewing Course, making this event fun and educational. A meet and greet with the CIA’s head Brewer Hutch Kugeman will take place, along with the chance to meet other New York State Brewers and beer experts. Dishes prepared by CIA Chefs to pair perfectly with all the craft brew samples will also be available. “We are thrilled to be bringing together this special selection of breweries to one event on campus, I really want to offer attendees a taste of beers that are a bit harder to find and have really interesting and unique flavors,” says Kugeman. For those who want to broaden their beer knowledge, Brew U will be hosting a series of seminars given by the CIA and visiting brewing industry experts. This years seminars will include Beer 101: The Art & Science of Brewing, Barrel Aging Beer 101, History of Brewing in the Hudson Valley, an Introduction to Farmhouse Ales, and a Beer and Cheese Pairing Workshop. An exclusion session for VIP attendees Baking with Spent Grains will be held at 1:15pm. The festival will take place at The Egg in the Student Commons at the CIA’s Hyde Park Campus. VIP Admission will be 1-5pm and General Admission will be from 2-5pm. VIP ticket holders will enjoy an exclusion hour prior to general admission to get first pour on the beers and a jump-start on tasting all the food. VIP attendees will also receive an exclusive goodie bag. 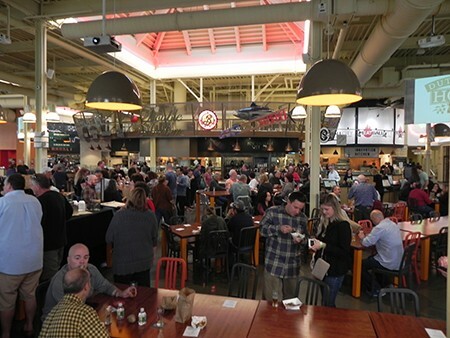 General admission to Brew U includes all beer and food during the event, access to all the tours and educational seminars, and a commemorative tasting glass. VIP Admission is $110, but is currently sold out. Tickets for General Admission are still available for $85. Designated Driver tickets are also available for $25.